In March 2018, we honored our 2018 neighbors of longstanding, Vivian Hewitt, Margaret Beels, and Christian Beels. I’m delighted to introduce the newest inductees to our Residents of Long-Standing Hall of Fame. For those of you unfamiliar with the program, it was initiated in 2010 as a companion to the West End Preservation Society’s ultimately successful effort to achieve landmark status for West End Ave. While WEPS made the buildings and their histories their priority, the Block Association made the people who live in them and the stories they could tell our focus. It’s been my enormous pleasure to interview our inductees. They’ve all been so generous with their time, invited me into their homes, and shared personal details and fascinating anecdotes with me. You can read brief bios and see resident photographer Gus Butera’s beautiful portraits of the five couples and 17 individuals we’ve inducted in the past by clicking on the Neighborhood Hall of Fame tab on the home page of our website. Right now you can meet the newest inductees. I’ll introduce them in order of longevity in our neighborhood. Dame Vivian Davidson Hewitt, yes, she is an official recipient of the British title, moved here first, in 1964. If I listed all of the firsts that Mrs. Hewitt can lay claim to, we’d be here until tomorrow. In sum, I can say that she was the first African-American chief librarian for the Rockefeller Foundation, the Carnegie Endowment for International Peace, and the Council on Foreign Relations, and was the first African-American president of the Special Libraries Association. She is believed to be the first African-American librarian to work in the city of Pittsburgh. She’s even more well-known and highly regarded for having amassed an enormous, finely curated collection of Afro-American art, which was purchased by Bank of American in 1998, and spent 10 years touring before settling into its permanent home, the $18-million Harvey B. Gantt Center for African-American Arts and Culture in Charlotte, NC. Closer to our collective home, she was among a very small handful of families of color who managed to put down roots on West End Ave., which was known at the time as Park Ave. West and was notoriously off-limits to people of color. On a whim one Christmas, while living uptown in Sugar Hill with her husband John and his three sisters, she wished out loud for a home of their own. While she was out of town, with the help of a civil-rights minded broker, John found one for her. 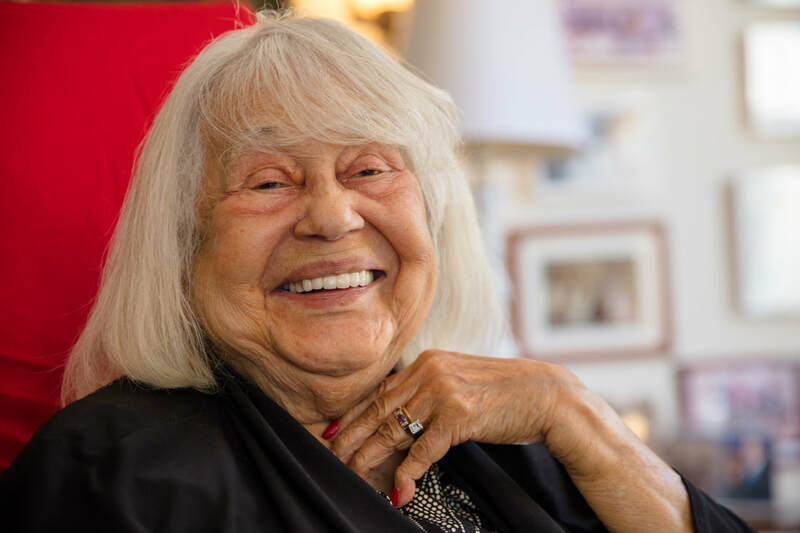 After recovering from her initial shock, she and John, a medical journalist and freelance writer, bought the building, and gradually renovated the upper-level SRO rental apartments as well as their living quarters. They created a two-story living room, which became the gallery for their ever-growing collection of paintings and photographs, many of them depicting the family with all of the biggest names in politics and the arts: Gordon Parks, Sidney Poitier, the Clintons, and John Lewis, to name just a few. Her wish for a home came true, and there they raised their adolescent son John, who later became known as Dr. John and, after retiring from his medical practice, moved home and opted to serve with good humor and abundant energy for several years on the Block Association board. Mrs. Hewitt still owns the family townhouse, but currently resides in one of the larger buildings in the neighborhood so she can avail herself of conveniences like an elevator. She continues to be surrounded by some of her favorite artworks, continues to travel, especially when the trip is toward an exciting end such as receiving an honorary doctorate. She’s received two so far. Maybe they’re the beginning of a new collection? She is also the author of The One and Only Vivian Davidson Hewitt, an autobiography available on Amazon. You’ll find additional biographical information about Mrs.Hewitt on the internet as well. She’s in frequent contact with her son, her two granddaughters and her eight great grandchildren, and working on her bucket list. Remaining items: meeting Queen Elizabeth, which she’s working through a coincidental association with Sir Elton John—they’re the only two people who have celebrated their birthdays at St. John the Divine, at which she volunteered for 25 years--and flying on a corporate jet. If anyone has any pull there, please let her know. When asked to compare the neighborhood then and now, Mrs. Hewitt’s first observation was that the neighborhood has changed for the better. “If there is still racism, at least it’s covert,” she said, before speaking passionately about the change for the worse nationwide that “that bully in the White House” has inspired, and comparing today’s West End Ave. to the Upper East Side’s East End Ave. She also reflected that the neighborhood continues to be a fertile home base for intellectuals, culture, and the arts, as it has always been. 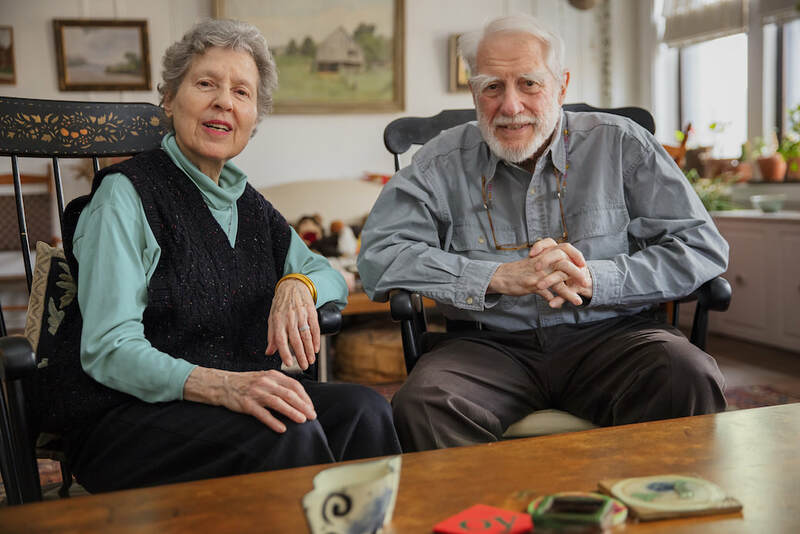 Which brings us to Chris and Margaret Beels, who are as good an example of the intellectual and artistic nature of our neighborhood as can be found. Residents since 1967, together they have devoted their entire working lives to the field of mental health. Chris is a former Columbia University professor of psychiatry, and a co-founder of the Columbia University Public Psychiatry fellowship. Margaret is a social worker, and they’ve specialized in family therapy, seeing countless patients and their families and authoring numerous papers on the topic. They’ve filled their home with books and artworks, including many paintings done by Chris as well as talented friends and members of their extended family. Chris has been painting for some 50 years. Maybe someday he too will be awarded an honorary doctorate! Margaret is on the board of the Metropolitan Playhouse, which has Resistance as its theme this year. Although Margaret grew up on Riverside Dr., Chris is originally from Oklahoma and moved many times in his youth. They noticed each other at a meeting of a college drama club, but didn’t officially meet until they both attended the same engagement party. They’re still friends with that couple who, conveniently, also live on West End Ave. Chris and Margaret married, lived for a bit on the Upper West Side, then wound up in D.C. while Christian worked in the Public Health Service, first in a house with a lawn, then quite deliberately in a house without one. Military service completed, they were eager to move back to New York. Margaret came to town for 48 hours on a mission to find them a home. In homing pigeon fashion, she came right back to the Upper West Side. A savvy broker—perhaps the same one John Hewitt met—directed her to check out an apartment that, although promised to someone else, might yet be available, as the other party hadn’t made it a priority to make an appointment to see it. Margaret called, but the resident said she was in too much pain from dental surgery to see anyone. Margaret’s expression of sympathy led the resident to allow Margaret to look at the apartment if she could get there in 10 minutes. Timing is everything, isn’t it? While she was in the apartment, she noticed that there were two pianos and politely inquired why. It turned out that the woman living there was the widow of Noah Greenberg, a pioneer in early music, with whom Margaret was familiar, further sealing the deal, and they haven’t moved—and don’t expect to—since. In fact, the neighborhood’s suitability for people of all ages is one of the characteristics of the neighborhood that they believe haven’t changed. “It was and still is a great place for old people,” says Chris. He recalled a particular man who’d sit downstairs in his wheelchair in part to capitalize on every opportunity to exert pressure on the landlord to maintain the building. I passed a woman sitting on her walker in front of their building just the other day, although I didn’t see her putting the screws to anyone. Although not the people to lay in wait in the building lobby, activism is and has always been a part of their lives. Chris served on the board of Project Renewal; Margaret is active with Three Parks Independent Democrats and has lately been organizing weekend protest marches that go as far as Columbia and back. They also identify the built-in sense of community as a constant. Over the years, Chris and Margaret have made many friends in their building, including Anthony Bellov, who was a Block Association board member for many years, runs our annual Winter Solstice caroling, and inaugurated the Yard Sale. Anthony made friends with Margaret and Chris’s two children with hand-written signs in windows that faced each other across the air shaft that separated their apartments. Chris, in turn, painted Anthony’s portrait. Meanwhile, Margaret and Chris’s children have grown and produced two grandchildren, one of whom will get married later this spring, and Margaret and Chris have become the older generation they’d noticed when they moved in so many years ago. A change for the better that Margaret has noticed in the neighborhood is the creation of Bloomingdale Aging in Place. Chris is a former board member of the organization and Margaret is an enthusiastic participant of the stitching group. She and Chris together enjoy the Blooming Hour cocktail gatherings, and they also participate in the Bloomingdale Neighborhood History Group. She misses the greengrocers and the shops that served as impromptu gathering places for people, especially older residents. Margaret describes the unchanging nature of Riverside Park as another wonderful feature of the neighborhood that is much the same as it was not only when she moved back in, but when she was growing up. She recounted her mother’s words of wisdom, some of which hold as true today as they did in the pre-internet age: Don’t go down to the lower level of the park after dusk or before 10 a.m. on Sunday. Although these days you’re bound to find people biking, running and walking their dogs in the early morning hours, even on a Sunday, after dark most parks are chancy places and we’d all do well to heed Margaret’s mother’s advice.